On 9 August 1757, in a remote cottage in the parish of Westerkirk in Eskdale, Scotland, Janet Telford gave birth to a son, Thomas. He was her second son  the first, also named Thomas, had died as a young baby. Their father was John Telford, an Eskdale shepherd. He too died, only four months after our Thomas was born. Janet was left to bring the baby up alone. Janet Telford, whose maiden name was Jackson, was a proud woman but she did accept support from the community, particularly from her brother Thomas Jackson. Although poor, she managed to send her son to the local village school, where he struck up a lasting friendship with Andrew Little, who later became a schoolmaster and whose son Telford would help in later life. 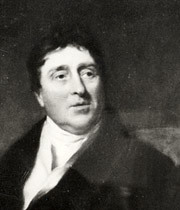 Thomas Telford left school at age 15 (in 1772) with a good basic education. He took up a stonemason apprenticeship in Lochmaben but this was short-lived as he was treated badly. He was then apprenticed to Andrew Thomson at Langholm, where he worked on simple buldings. 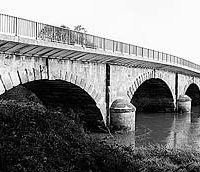 Langholm Bridge (c1778) across the River Esk bears a masonry mark said to be his. Young Thomas taught himself letter carving. He carved a headstone for his father's grave in Westerkirk's churchyard, and, reputedly, a memorial to the Pasley family. The elderly Miss Elizabeth Pasley, whose extensive library he often scoured, had befriended him. In 1780, Telford headed off to Edinburgh, where as well as developing his masonry skills, he studied the the city's architecture. He is reputed to have worked on buildings in Edinburgh's 'New Town', then under construction (begun 1765). Outside the city, he spent time drawing the Gothic splendour of Melrose Abbey and the mysterious Rosslyn Chapel. Restless for a challenge, Thomas moved to London in February 1782. His friendship with Miss Pasley led him to a contract working on the construction of the new Somerset House, as, through her brother, he met Sir William Chambers (1723-1796), its architect. He was also introduced to the architect Robert Adam (1728-1792). So, Thomas found himself working as a stonemason on one of the most prestigious new buildings in the capital. While in London, Telford was consulted on alterations to Sir James Johnstone's house back in Eskdale. Sir James' younger brother, William Pulteney, oversaw the work and was so impressed with Telford that he employed him on a second commission  the restoration of Sudborough Rectory in Northamptonshire. Over the years, Pulteney was to become a powerful patron and close friend, so much so that Telford was often referred to as the 'young Pulteney'. Through a shared love of poetry he also formed a firm friendship with Rev. Archibald Alison who lived in the rectory. The project at Sudborough gave Telford the opportunity to prove himself in working directly with a client. By 1784 the funding for Somerset House had given out and Telford headed off to Portsmouth. Huge engineering works on the dockyard were underway there and he obtained work on the dockyard commissioner's house and the chapel, both designed by Samuel Wyatt (1737-1807). He stayed for two years, and, showing ability and confidence, was soon overseeing the two contracts  Telford's first position of independence and responsibility. He was also able to observe harbour and dock construction at close hand, and he began keeping a notebook of useful information, some of which was later published. In 1786, Pulteney's patronage came into play again. Pulteney, in his new role as MP for Shrewsbury, invited Telford to restore Shrewsbury Castle, Shropshire. Now Telford makes a leap: from stonemason to architect. He lived at the castle during the restoration and worked from there. 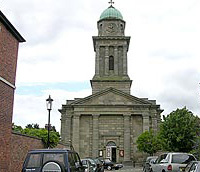 Between 1787 and 1793, he worked on private houses and a series of church buildings, including new churches at Bridgnorth and Madeley and the restoration of St Mary's, Shewsbury. In 1787, with a reference from Robert Adam, Telford became clerk of works for Shropshire's new county gaol. He then became County Surveyor of Public Works, a position he was to hold all his life (in later years through his deputy, Thomas Stanton). His responsibilities included public buildings such as the county infirmary, street improvements and the provision of at least 42 bridges (such as Montfort Bridge. Telford leapt at the chances he was given in Shropshire, and he really made his mark. Pulteney was also a director of the British Fisheries Society and this led to Telford's lifelong connection to with it, starting in 1790. Through the society he would work on many harbours and settlements on northern Scotland, and this work led directly to his surveys of the highlands in 1801-02 for the government. However, for now, Telford had his eye on other things. He supervised the excavation of the Roman ruins of Uriconium near Wroxeter, the published plans of which are his earliest known drawings in print. In 1793, he set off on a tour of Bath, London and Oxford to study architecture and antiquities. But his future wasn't to be a career as an architect. The highland survey work to come would in turn bring about the establishment of the Commission for Roads and Bridges, and one of his greatest engineering feats  the Caledonian Canal.